Bert Reese is senior vice president and CIO of Sentara Healthcare of Norfolk, VA.
You’ve been at Sentara forever. What’s the secret to CIO longevity? I think the secret is to make sure that the technology is aligned with the enterprise, both the clinical and business initiatives that the company is addressing. So the closer the IT is aligned to the business and the more you are able to deliver on that, the more successful a CIO would be. Sentara was mentioned recently for developing its own interface from Epic to Picis LYNX. Tell me a little bit about that project. We were a Picis LYNX customer before we did Epic. The problem that we were trying to solve with LYNX was our inability to code properly in the ED, and therefore, our billings were inaccurate. What the Picis LYNX software did for us, prior to Epic, was give us the ability to properly code the patient during the visit. We saw that in the old world, prior to LYNX, that we were under-coding, which actually meant that we were understating our revenue potentials from the ED, and from a clinical perspective, not really indicating the proper problem that the patient was being treated for. With the LYNX software, since it’s a logical part of work in ED, it was more convenient for the nurses to code as part of the care process, so it’s worked out very well for us. We went to Epic, and we wanted to preserve the capability of LYNX, so we developed an interface between LYNX and Epic to allow us to move information from Epic down to LYNX so that they could continue to use the coding software in a convenient way. One of the issues that you have is that nurses and caregivers don’t see coding as value-added to the care process; it’s more an administrative function. So when you want them to do something like that, if you can make it a byproduct of how you treat the patient. Then it’s a lot more convenient and they’ll do it. That’s what we did. It’s pretty straightforward; that’s the real secret sauce is in the Picis LYNX software. Your EMR project is said to have cost $237 million. How will you measure its benefits? That’s a great question. So it’s $270 million over ten years. The first thing was we set an expectation that a project of this magnitude goes out over an extended period of time and that you have to set the expectations of the company that they will be spending this kind of money for awhile. The second piece of it is that when we started the project, we identified 18 major clinical processes that drive about a $35 million-a-year annual return of investment. We have identified those, we have four of our eight hospitals up, and we have seen benefits this year – `09 – at around $16.7 million. So we know from a dollars-and-cents perspective that electronic medical records do create economic value. If you take that $35 million over the $270 million investment, that’s like an internal rate of return of about 12.3%. That’s a good return of your investment. The other part of it relates to clinical quality indicators. If you follow the clinical quality indicators and see some level of improvement in clinical quality activity — that is, you see the patients are being better cared for under electronic medical record — then there is that benefit as well. We have seen great clinical quality. I’ll give you an example of one. In the old world, it would take 137 minutes for the doctor to enter a medication in the hospital before it was administered to the patient. Now, it’s less than five. And there’s tons of stuff on turnaround time and length of stay and things like that. The key to this — in looking at the return of investment, you look for where there is hunting and gathering of information, i.e., you’re looking for the old paper chart and/or whether there will be hand-offs between one care partner to another care partner. That is where the opportunities are for both economic and clinical quality savings. What are your overall impressions of the Epic system and its implementation? First of all, in the way of background, I’ve got experience with Cerner, Eclipsys, Epic and GE’s IDX/Centricity, so I’ve seen a lot of them. I will tell you coming out of the chute that you can have the best software in the world, but if you do a sloppy install where you support it in an inappropriate way, you’re going to have a failure. Part of the secret sauce is in the quality of the software. I would say the other part of the secret sauce is in the quality of the local IT staff. Then, the culture of the company who’s adopting the technology. In the case of Epic, Epic is a superb piece of software. It’s not buggy. It comes very, very clean. They’re a very collaborative company. That makes it easier. It’s less mysterious on the IT side about what it is you’re going to get and what you’re trying to do with the software when you get it fixed, or an upgrade or something like that. But I will tell you that the responsibility, ultimately, is at the hospital or health system level. They need to make sure they made the right investment in order to have a varsity team to be able to support an application, either in the Cerner, Eclipsys, or an Epic type of venue. Did you use outsourcing for the implementation? I used it in an unusual way. In the old world, I was converting from a TDS 7000 to Epic and I had a choice: I could either bring in new staff, or outsource staff to help me with Epic, or I could take my Eclipsys support and give it to an outsourcer — it will move my old staff to learn Epic. I elected to do the latter. We hired Perot Systems to commit and run our Eclipsys environment for us while we took our old medical systems team, retooled them on the Epic toolset, and had them support the implementations. Perot is still with us today because we have a couple more hospitals to do on the Eclipsys side, and so they’ve been with me for about five years or so. They do a great job. How have your IT strategies changed, or have they changed, with the economic climate? First of all, I want to make a comment. What we’re doing is not about electronic medical records. In our view, in our culture, an electronic medical record — when you have it implemented, most organizations will become a technology-driven company, and our advice is: skate to where the puck is. The puck is not being a technology-driven company. The puck is going to be when you are a data-driven company, meaning that in order to use the data, a prerequisite is to have the electronic medical record. When you have the data, the advantage will go not to the organization that has the EMR. It will go to the organization who can convert data to information, to knowledge, to action the quickest both business-wise and clinically. I’ll give you an example. In the old paper world, I could tell whether you had been in the hospital, whether you had pneumonia, and whether you had an antibiotic administered; but, I couldn’t tell you when I gave you the antibiotic. I can’t tell you the outcome. The outcome would manifest itself. Does it shorten the length of your stay? Did you have more doctors’ office visits at the end of your hospital episode? Because I couldn’t see across the continuum of care. Now we know when we study the data that when you present with pneumonia in the doctor’s office or in the ED, and the doctor concludes that it’s serious enough that he wants to have you admitted, to onboard the antibiotic as soon as possible. So if I know you’re in the practice or in the ED, and I’m going to send you to the hospital, I’m going to give the antibiotic immediately, because we know that getting the antibiotic onboard will start the curative process, will shorten the length of stay, and shorten the subsequent doctor office visits that are required. That improves the care for that patient and reduces the cost. You can’t do that without having the data. You can’t do that without having electronic medical record, so that when you decide to tell the care delivery team if you’ve got a diagnosis of pneumonia, "Give the antibiotic now," because you can communicate it electronically to all sites — you can’t do it without that. So the electronic medical record in our view is, "Welcome to the starting line." It’s going to revolutionarily change healthcare. As it relates to my current level of investment given the current economics, they’re giving us more money. They believe in what I just stated. They believe it’s all about data and the new information that will be created. So if I was going to summarize it for you: electronic medical records improve quality and make money and they position you for extraordinary opportunities that you’ve never imagined. You have to have administration that supports that concept? Yes, absolutely. I think what the role of IT is in the future is that a lot of times, our customers are a rearview mirror. They’re not a guide to the future. So a customer, perhaps, would have never invented the television set, the microwave, the iPhone. It was technologists who invented those technologies and innovations, right? And so it is the role of technology in the enterprise or in the health system to create a new reality for the company based on the technologies that are available. That’s a big statement. I don’t wait for my administrative staff to create a new reality. I, because I understand the technology, create a new reality on their behalf. Back to your first question about how it is that you last so long as a CIO in the organization, it’s because I’ve been able to innovate in front of the company to improve what it is that they wanted to do. Tell me about your internal work with standardization. You’re right on point. That is part of the secret sauce. If you’re going to report on data, that means that you have to call the same thing the same thing across the enterprise. So a chest bilateral is a chest bilateral, not a chest x-ray. And, more importantly, you have to have the same lab normal values across the enterprise. One pathologist may say with a CBC, "This is a normal value," and another pathologist may say, "That is a different value from the normal limit." One of the discussions you have to have early on is — what are you going to call things? What will be the standard of practice within the enterprise? So from the Sentara perspective, we are heavily standardized. We took a page out of the banking business back in the late 80s, early 90s where bank mergers took place and went through a heavy standardization. You’ve seen it with stimulus packages and banking consolidations. We took a page out of how they did their conversions and we decided to go that way. When we affiliate with a new hospital or a doctor’s group, we bring them onto our standards suite with their application. 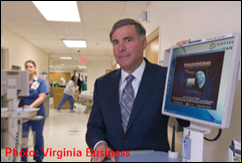 In the case of my eight hospitals, there are no Norfolk General status set screens, there are no Sentara Careplex status screens; there are only Sentara Healthcare status screens. All those hospitals collaborate in what those screen flips look like, which means heavy dialogue, heavy participation, great collaboration, and a lot of fun. How important are mobile devices for your clinical projects? Not so much. The biggest extent of mobile devices we have are WOWs, workstations on wheels. Medical staff is not pushed to move them to phones or tablets or anything like that. At the doctor practice level, inside the practices, we experimented with mobile devices and we found, based on the workflow, that the fixed workstation worked best. Let me describe that for you. If you’re a patient going to one of our doctors and you go into the exam room, you’re normally accompanied by the doctor’s nurse, who then logs on to the system and then enters your problem, enters any of your vital signs, any of your current meds, any changes in your physiology, and brings everything up to date. She then locks the workstation; she bookmarks where she is on your record, and locks it. When the doctor comes in to see you, he logs right on, right where the nurse picked up. So he doesn’t have to reacquire you as a patient, doesn’t have to ask any additional questions. He’s right where she left off, right where his workflow starts. If he was walking from exam room to exam room with a mobile device, he’d have to log on every time and reacquire the patient. I wade through all the patients I’m going to see that day. And so we found it to be faster if the nurse does her work like she normally would, locks the workstation — he comes in, logs on, and he just picks up right where her summary of the information is and carries on the conversation with the patient. So mobile devices have been interesting for us, but that’s where we are right now. The only other thing I would say around community physicians and electronic medical record — there’s stimulus money out there for doctors that go up on electronic medical record. I would say to the hospitals and the health systems that they have a responsibility to guide that conversation in their communities that they reside on behalf of their community-based physicians. They should become the rallying point, they should become the center of truth, and to help the doctors with the decisions they have to make on the electronic medical record, because they have the capability of doing it. What I don’t want to have happen is I don’t want a doctor, because he’s anxious about the stimulus money or losing Medicare funding, to make a knee-jerk reaction to a decision. I believe in the theme of better together, and I’d like to have my community doctors as close to us as possible so we can all go there together. And that if we make a mistake, well, we’d all make it together, and hopefully we’d have the power of crowds, maybe we’ll learn from each other. I would encourage everybody to take on the responsibility of helping to guide the community physicians as to what they should do with the electronic medical record. There is certainly benefit for the hospital, but there’s also certainly a benefit for the patient. If you control the conversation or help guide the conversation, you’ll probably minimize the number of technologies that you have in your community. That means we can start to solve the interoperability problem when you have to hand the data off from a primary care doctor who’s on the XYZ system to a specialist who’s on another system, that the chances of that being done successfully and clinically correct is improved. So I think the patient benefits, and then ultimately the hospital and the caregivers, because they’re able to have more information in order to care for the patient better. Ultimately, it’s all about the patient. Outstanding interview! I really appreciated his honesty as well as his understanding of the vendor landscape. Not only that, but the piece at the end about the stimulus money. We all know the carrot & stick analogy and it can really freak a lot of physicians out. But in the end, having the hospital…especially community hospitals…be the voice of truth and help the physicians wade through the muddy waters of understanding vendors, understanding interoperability, and then finally understanding where it hits their bottom line, it can aid greatly to what we are ultimately wanting to do with the stimulus money. In the end, we all know that still very few will qualify for the stimulus money when it is all said and done for in 2015 (I believe we have all heard stats that less than 10% of all hospitals & practices in the US can even qualify today)…all we can hope for is that most are finally in a position to move forward with an EMR to avoid as many penalties as they are looking at coming down the pipeline. Practices and especially community hospitals where their medicare/medicaid population is above 50% are going to be strangled with penalties for reimbursements they already don’t receive. I believe it is not only the job of the vendor partner to help educate the hospitals on what they can do to be ready & to avoid the penalties, but also the strong leadership at the hospital to help educate the hospital and the surrounding practices. Hospitals that are just now making their clinical decisions or are ripping out their existing systems and going forward with another vendor will probably be on the outside looking in. No offense to the fad to switch to Epic right now, but a giant bottleneck is looming…just as it was for so many Cerner customers in the early part of this century. In the end, if true interoperability is to be in place, no longer will there be the need for giant “integrated platforms” or one vendor in order to have an unbroken continuum of care. Everyone will be forced to play nicely in the same sandbox. Unfortunately for some of the smaller players, the expense may be too great to keep up with the standards and writing of new communication language that we may see in the end only the larger vendors still left standing. Same old tired healthcare IT story. Choose a vendor, hire a consultant and then spend an obscene amount. I am waiting to hear from a CIO from a large U.S. hospital that is not worried about career preservation and develops the software on his own. $270 million!!!!! Hard to believe. This is more than most Silicon Valley start ups ever see. Find anyone who could fund a full install, training, total operating costs for workstations to servers to networks to staff PLUS build and fund a team to write the software that it has taken companies a decade or more to get to the level that a doctor and keep up and create a meaningful patient record for an organization like Sentara for less. You’re twisting the numbers and you probably know it, so I write tihs for those who may not realize what you’re doing. To SameOldDistortion, I am not exactly sure what I distorted but your words are spoken like a true healthcare veteran, unfortunately. We’re talking 270 million, more than a quarter billion. That’s quite a few workstations, servers and developers. The cost is astronomical because hospitals have no leverage when negotiating with large vendors. In any other industry, once the 270 million quote arrives the vendor is sent packing and the software is developed in house. There is also an overwhelming assumption in healthcare that healthcare software is more complicated than other industries and development is rocket science. It is not. Interesting reading from a previous HIStalk post regarding a Hong Kong CIO. Large or small hospital, this would never happen in the U.S. I think SameOldStory is missing the point. The 270 million wasn’t a vendor quote. It was mostly internal costs and over 10 Years. That’s 27 million budget per year for an organization the size of Sentara. If SOS has a 10 year financial model, I’d bet Mr HISTalk would be happy to share it and I’d bet Bert R. from Sentara would be happy to comment on it. You could get any number of pretty darn good companies to comment on their total development costs and R&D investments. – SOS – if you’ve got a plan, just detail it out and let others comment on it. SameOldStory, do you actually work in this field and are you really prepared to debate actual requirements of these systems, or do you see a $$ figure and make the reasonable but incorrect assumption that if you were given that budget, that you could create an integrated healthcare information system that doesn’t kill patients? Because I can tell you, from 2 decades of experience, you are dead wrong. EPIC has been at this since 1979, MEDITECH since 1969. This industry changes dramatically on the whim of Congress and the data stored and processed is extremely complex and inter-related. Most HIT vendors have been through at least 2 if not 3 or more full iterations of their software, and lets not forget that many if not most facilities/health systems pay much less than $270 million for their HIT systems. Epic tends to be on the high side of the price spectrum, and will not even respond to quotes for hospitals or health systems that are under 500 beds (I can’t speak for practices). Let’s take a look back into the DIY HIS annuls, and pull up this gem: http://www.modernphysician.com/article/20030201/MODERNPHYSICIAN/302010715 which is a Modern Physician article describing the development of Patient Care eXpert (PCX)by Perot Systems for Cedars-Sinai hospital in Los Angeles. That is not to say that all in-house developed programs fail. Octo Barnett, father of the oft-maligned in this industry MUMPS (or M), has been doing it for close to 45 years now, quite successfully. But he has a large staff (60+, including 14 MD’s/PhD’s), large facilities backing him, and the benefit of being a Harvard professor, who has 45 years of experience doing this sort of thing. Most critical access and community hospitals in this country have none of these things, and quite honestly cannot and should not attempt to develop a HIS system from scratch. The other thing I think you fail to grasp is the scope of such an endeavor: It’s really not like developing one application, more like developing 30 large applications. There are so many aspects to this business and the information systems that serve it that I think it’s naiive to think that this can all be done in one monolithic application. Even in the article you reference, it is not clear what it is he’s actually developing; it sounds more like he will be creating a system to connect the disparate systems they already have in place. Lesson learned: Just because you can develop it, does not mean you should. Hospitals do not deal in widgets, and errors in medical systems can mean serious injury or death for patients. Even a well-planned out system, with professional developers and physician input can catastrophically fail. I beseech you SameOldStory, if you do not understand this business, please do not go around the web bitching about the amount a hospital or health system spends on the licensing and implementation (usually much more $$ than the license fee, and includes things such as highly skilled staff’s time for training and getting their input in the design/setup of the system) of a mature, integrated and proven product in an industry that really cannot tolerate anything less. Tell me, where would you rather your mother (or wife/child, etc.) be treated? In the place that over-spent for a HIS that is proven, tested, and provides accurate clinical decision support, or the place that is still “working out the bugs” from its home-grown system? Yes, 270 million is a lot of cash but the low down on EMR benefits for the user, the carryover from one caregiver to another in the concluding part are a great take-home from Bert !